This was a great board but we made it better! Checkout the new version, BlackBoard C! We've applied every lesson we've learned about making a better Uno and created the BlackBoard. The USB to serial is now done with the ubiquitous CH340G requiring fewer driver installs and a rock solid microB connector with through hole anchoring. The power portion of the BlackBoard has been reworked: we upgraded the 3.3V regulator to provide up to 600mA, with full thermal and reverse circuit protection, and added extra decoupling capacitance to increase the sensitivity of the ADC readings. We've decreased the brightness of the power LED, pin 13 LED, and the TX/RX LEDs from blinding to just perfect. We've added 3.3V voltage translation and a Qwiic connector to the edge of the board to allow for quick and seamless connection to our ever-growing line of I2C based Qwiic products. And for more advanced users we've added an I/O jumper. Cut the trace to 5V and solder a jumper to the 3.3V side and the board will run at 3.3V. This is extremely handy if you have a shield or 3.3V sensitive devices, such as an SPI interface, that needs protecting. 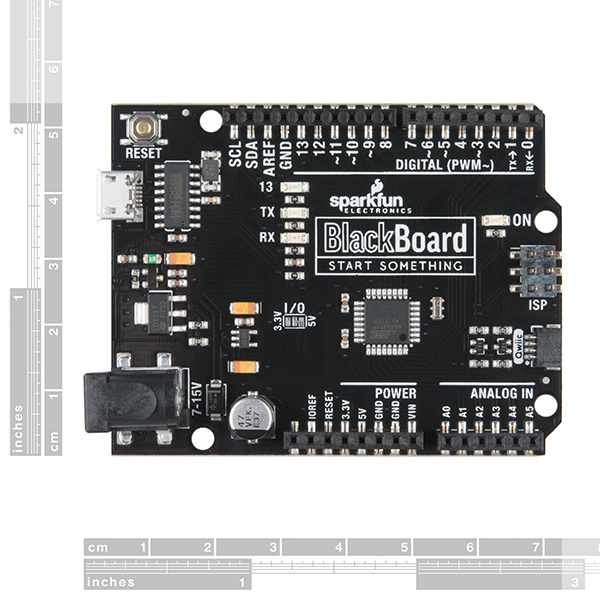 The SparkFun BlackBoard comes fully tested with the Optiboot bootloader and can be easily programmed with the 'Arduino/Genuino Uno' option from within Arduino. 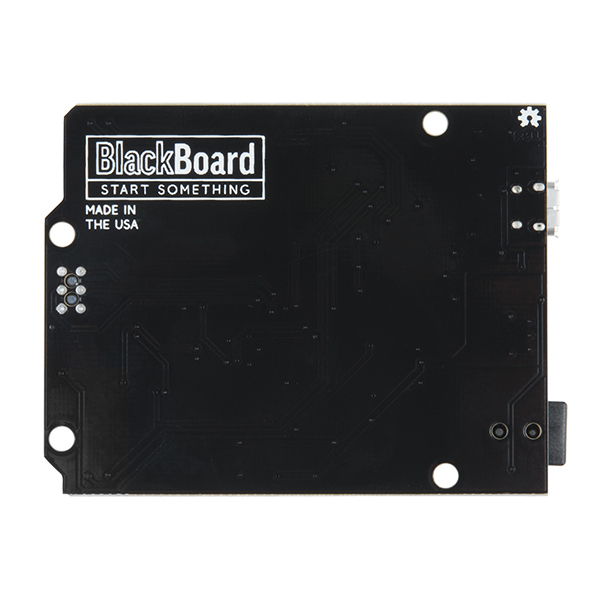 You can power the BlackBoard over USB or through the barrel jack. The on-board power regulator can handle anything from 7 to 15VDC. Check out the related items below for a compatible wall-wart power supply. A4/A5 Pins: We recommend you don't use A4/A5 for analog to digital conversion. The Qwiic connector is wired to the I2C pins on the BlackBoard. This means A4 and A5 have external 2.2k pull up resistors and will affect readings if you use them as analog to digital conversion pins. A0 through A3 still work fine as ADC pins. Drivers: The CH340G uses CDC drivers built in to most modern OS including Windows 7, 8, 10, Linux Mint, OSX Yosemite, El Capitan, and Sierra which means you shouldn't need to install any extra software. However, there are a wide range of operating systems out there, so, if you run into driver problems, you can get drivers here. "And for more advanced users weâve added an I/O jumper. Cut the trace to 5V and solder a jumper to the 3.3V side and the board will run at 3.3V. This is extremely handy if you have a shield or 3.3V sensitive devices, such as an SPI interface, that needs protecting." Fan-freeing-tastic. Final a board I can use for experiments with a small jumper change. Thank you for the brightness adjustment! All my redboards, which are awesome, have black electrical tape. Also, the price is nice! Thanks! LED technology has gotten pretty wild. We had to throttle the green LEDs with a 10k resistor limiting the current to microamps and it's still bright. There will some day be a company that manufactures specifically NOT bright LEDs. Onboard Qwiic connector is a lifesaver. So far, I really like the improvements. While the adjustments are small on their own, I'd definitely say this is a case where the net result exceeds the sum of the individual changes. Greater 3.3V rail capacity and qwiic support are particularly welcome. Since this is still a SparkX project, if I could make one suggestion, it would be nice to break out ADC6+7 somewhere to compensate for the on-board I2C pullups on 5+6. Maybe solder jumpers that allow swapping the pin connections to the headers, or a couple holes to allow manual addition of 0.1" headers? Definitely understand not wiring them by default, as they aren't usable as digital pins, and could have some compatibility issues. I have played with micro:bit, RPI, Onion Omega2 and a Cortex M0 dev board, but this is my first Arduino. I'm usually annoyed by reviews from customers who have no idea how the product compares to competitors/other similar devices, but I feel this board is sort of a no-brainer. The quality of the board is nice, there are a lot of little tweaks over the "real" Arduino boards without causing major incompatibilities/idiosyncrasies . I am a fan of the clean and simple connections that qwiic provides and feel the micro usb and usb>serial chip compatibility tweaks are convenient. Selectable 3.3v or 5v control signals is a nice feature, but I haven't used it yet. The LEDs on this still seem pretty bright compared to other devices I listed above so the ones on the redboard must be blazing! 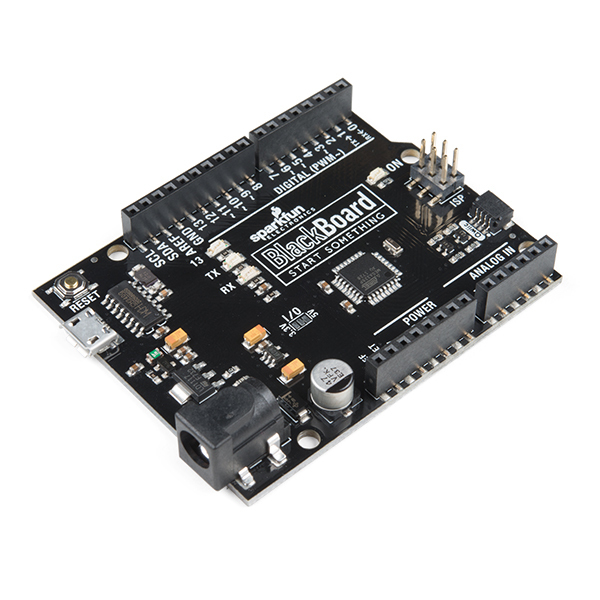 To top it all off, this is less expensive than a genuine Arduino product or the redboard version which has less features, and not significantly more than the generic Chinese boards. This seems like a board that some engineers took a good existing product and customized with changes that they thought would be useful. That's not a bad thing at all. 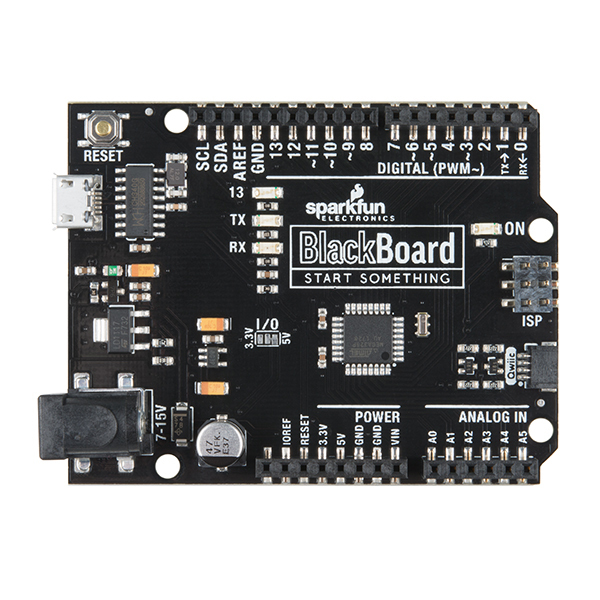 Basically, I feel this is a pretty good version of the Arduino platform to choose as a first device to learn on. The only con I can see is really just a personal preference, and I have seen it on other products commonly: I hate when development boards have semi-permanent jumpers. The idea of these devices is the board is designed to be reused for multiple projects. I know it is probably cutting costs for a feature not many will use, but I'd gladly pay an extra few cents to have a DIP or true jumper pins over having to cut traces/solder jumpers to change a voltage or interface option. Using it just as i would the other REDBOARDs. Same familiar footprint. The less bright power LED is convenient - so no need to put ugly black tape over the power LED. The Qwiic connector concept is super nice. If your circuit is pretty cookie cutter and the special sauce is in the code, then one can go straight from prototype to release without the added expense of using a proto-shield or making a board. I purchased three of these primarily because of the Qwiic connector. They are for a science fair project that my granddaughter and I are doing. The connector eliminates a little of the wiring complexity. They are working out great with the WiFi Shield as a remote sensor server. We are polling the remote sensor from a Raspberry Pi client. The sensor is a bit of a current hog at 3.3v, so the support for added current is appreciated. We are also stacking on a ProtoShield so that we have access to easily programmed on-board status lights for the headless server.